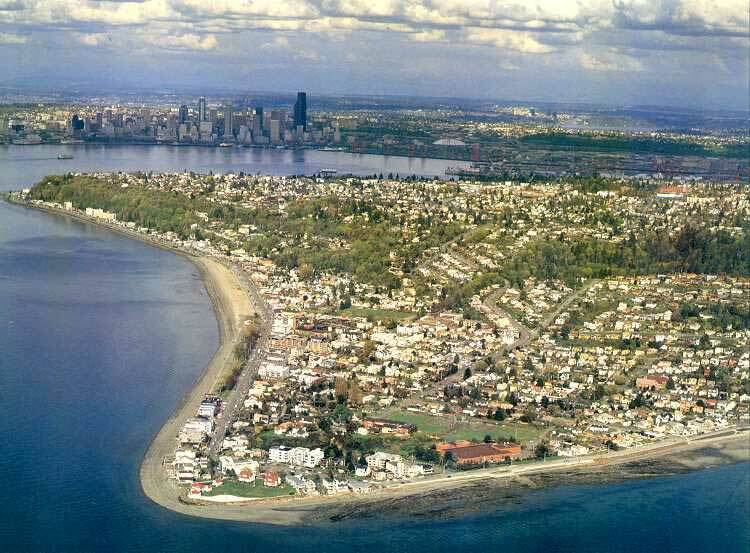 Alki Point, part of West Seattle, was where the first setters in this region landed. They beheld a centuries-old forest of giant trees so tall they "swept the stars." Logging felled nearly all the giants. But Ferdinand Scmitz, a banker and realtor, and his wife, Emma, recognized the forest heritage of Puget Sound would one day be lost. so they deeded a wooded ravine to the city in 1909 "for the purpose of perserving forever a reminder of the magnificent cathedral of forest" that so awed the first settlers. This ravine is known as Schmitz Park and can be seen at center right.